Congratulations to Tim Hiatt for becoming our latest Beekeeper of the Year! We received 3 outstanding nominations for our Beekeeper of the Year Award and Tim received the most votes. Background: Tim took on state government as chair of the Legislative Committee in 2014, which grew out of the Honey Bee Working Group, ordered into existence by the 2013 Legislature. The proviso of this group, comprised of WSDA, WASBA and other stakeholders, was to look at issues facing commercial beekeepers and identify ways in which the state can assist the industry. Focus was to be on bee health and habitat, economics, and regulations (Bee group work summary Dec. 12, 2013). By Dec 18, 2014, the 14-member group had developed a comprehensive work plan. All of this group (of which Tim was part) deserve credit for their efforts. Over the past two years, Tim and the Legislative Committee have spent endless hours on making legislators and the public aware of beekeeper issues, developing discussion papers and making presentations in Olympia. Despite some set-backs, there have been marked successes. 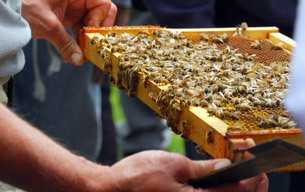 With the guidance of a legislative specialist to better understand and work with governmental procedures, there were passage of bills recognizing beekeepers as farmers in Washington State (as they have been nationally), establishing a pilot project for good bee forage plants to be seeded on Dept. of Transport-managed lands and substituted for blanket eradication of noxious weeds, provision for permanent funding of a new research position at Washington State University, and inclusion in efforts to fund the new Bee Lab at WSU Pullman. All these efforts have required hundreds of hours of effort in preparation – telephone calls, emails, meetings, and presentations in Olympia – to keep beekeeper interests in front of legislators. Tim has conducted this process so determinedly that Senator Judy Warnick has called him “relentless” and commended his dedication. Nor can these efforts be allowed to flag in the future. All of the Legislative Committee deserve our thanks and recognition for their work, but as chair, and with the responsibility that position entails, I believe Tim Hiatt deserves to be recognized by WASBA as Beekeeper of the Year for 2016.